The location for Stevi B’s menu prices. Stevi B’s Pizza Buffet is an all-you-can-eat restaurant that offers guests an assortment of original pizzas, desserts, and fresh salads. Stevi B’s locations are about fun, amazing food, and a welcoming dining atmosphere for adults and kids. The restaurant is a favorite among pizza-lovers who only want the best ingredients for their original-recipe pizzas. Everything is fresh, especially its salad selection. Even the desserts are uniquely created to ensure perfection. A unique menu, a game room that kids love, and superb service can be enjoyed at Stevi B’s at very reasonable prices. Below are the latest Stevi B’s menu prices. By signing up for the Stevi B’s Slice Nation Rewards program, guests will receive special offers, learn about the latest deals, and much more. All guests need is an email address. Sign up is on the Stevi B’s website. Most kids love to eat pizza but do they know how it is made? Stevi B’s offers groups the opportunity to learn about the process of making their original pizza. All group participants receive pizza and a drink. Guests interested in taking the tour should contact their nearest location for details. Besides their famous pizza, Stevi B’s locations also include a game room where kids can enjoy hours of fun. Stevi B’s is an ideal location to have a group gathering or team event. Groups can enjoy an all-you-can-eat buffet of pizza and salad and end it with a delicious dessert. After that, kids can check out the various games in the game room to try and win prizes. In 1996, two brothers opened the first Stevi B’s “Ultimate Pizza Buffet” just outside of Atlanta, GA. Eventually, the brothers agreed to start franchising other locations to grow the brand. Today, Stevi B’s Pizza Buffet has grown to over 40 locations strategically situated in 8 states. 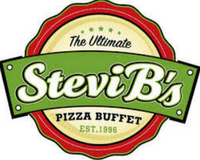 For more information about Stevi B’s Pizza Buffet, visit their official website. Does Stevi B’s Pizza Buffet offer delivery service? Stevi B’s is an all-you-can-eat sitdown restaurant that does not offer delivery service. When does Stevi B’s open and close? Need to fix your senior price on your web page. Web page show Buffet senior price is $4.99 an you charge me $6.29 each for 2 it was $12.58 and adult price show $6.49 and you charge me $6.99 on Sunday Oct 16 2016. You Web Page is Miss leading People.